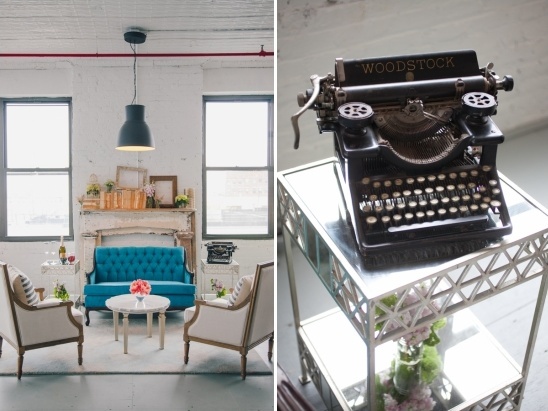 Our next inspirational shoot is to show all you brides that you can have your wedding in an industrial Brooklyn loft, but still have a soft and romantic setting. 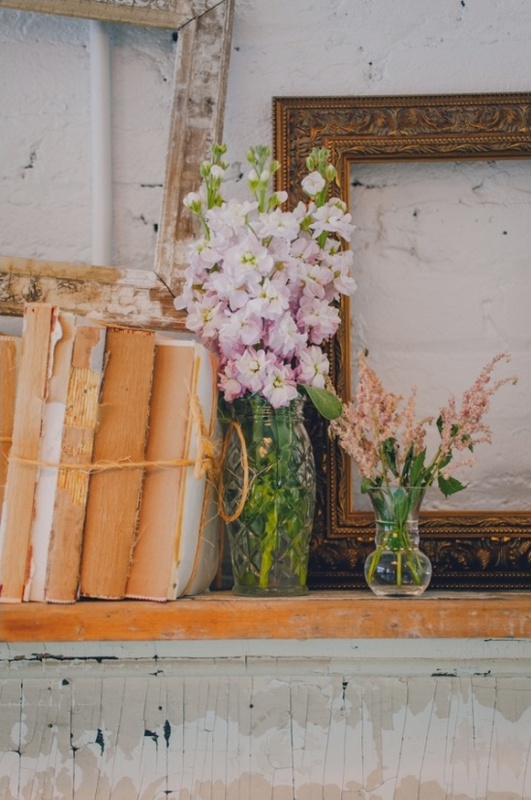 As you will soon see the entire shoot has a sophisticated, classic aesthetic chalk full of steal worthy ideas that you could easily replicate. 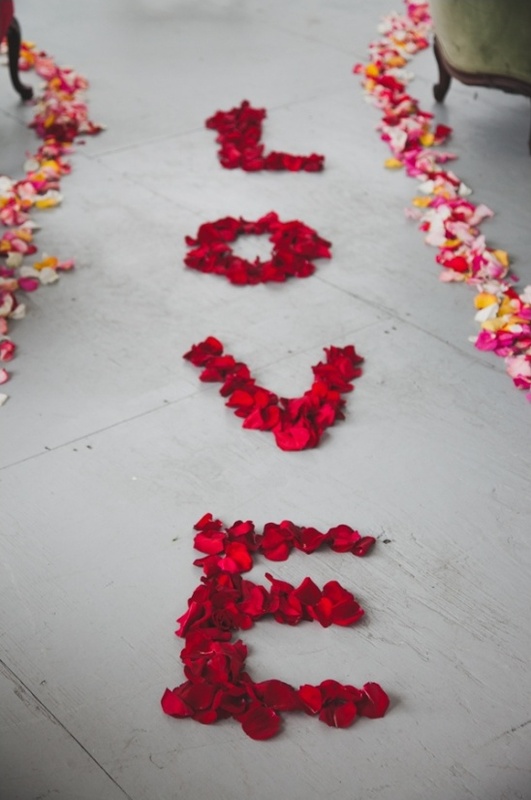 Our favorite has to be the word LOVE spelled out in rose petals as aisle decor. 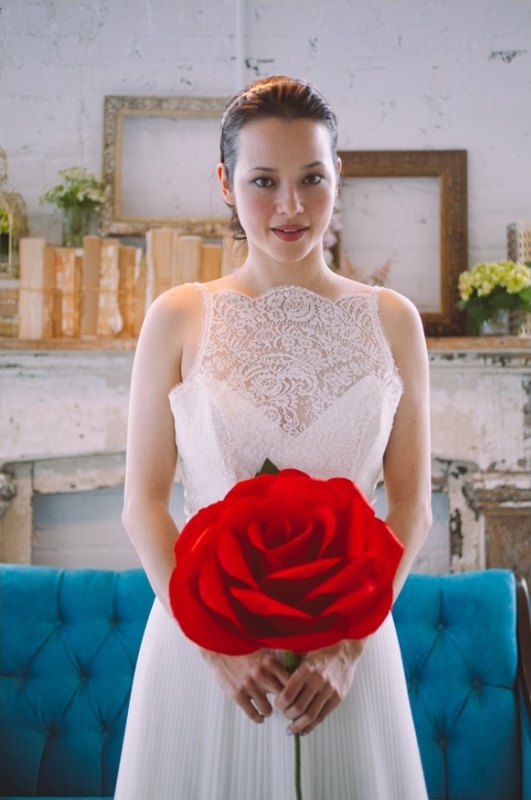 Designed and put together by Jove Meyer Events and fantastically photographed by Amber Gress. 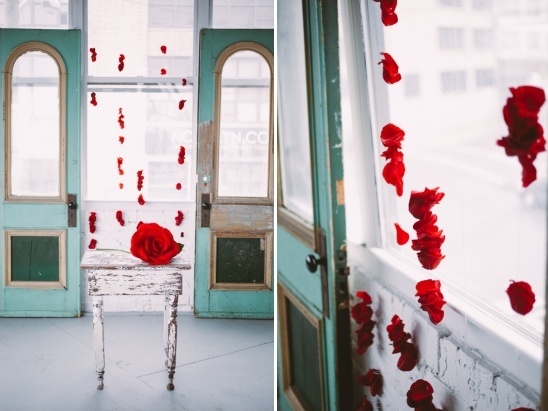 As always you can see more soft urban wedding ideas in the full gallery here. 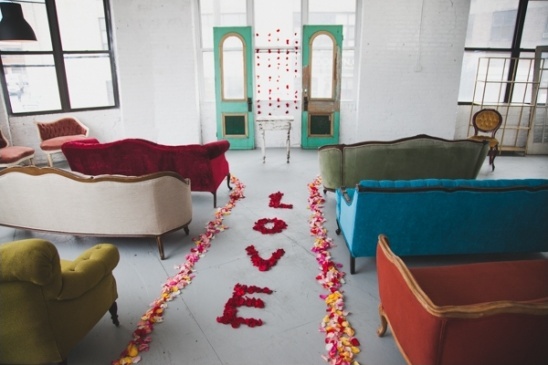 From the Vendors:For the ceremony, we used vintage couches for seating with two vintage doors framing the altar. We placed glass Cape Cod buoys at the entrance of the aisle, and used rose petals to spell the word of the day, "LOVE," down the middle. What to say about the dresses? 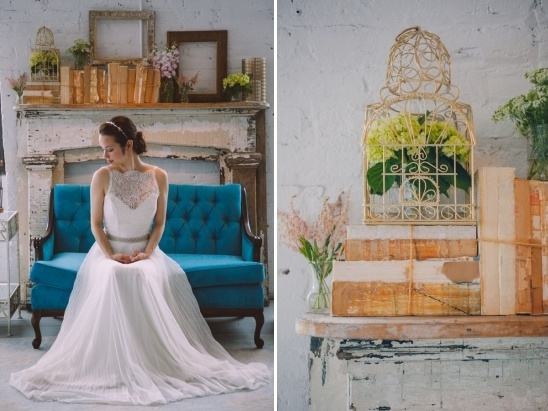 I decided on not one, but two gorgeous frocks for the ultimate bridal experience. (you can see the other dress here) For the ceremony, I chose a long, flowing gown designed by Brooklyn-based designer Rebecca Schone, of Schone Bridal, and a flirtier, tea-length dress for the reception, paired with vintage green heels. The tablescape was a vision in white, with an organza floral-patterned tablecloth, bright white candles, cream-colored plates and napkins wrapped around glass chargers. 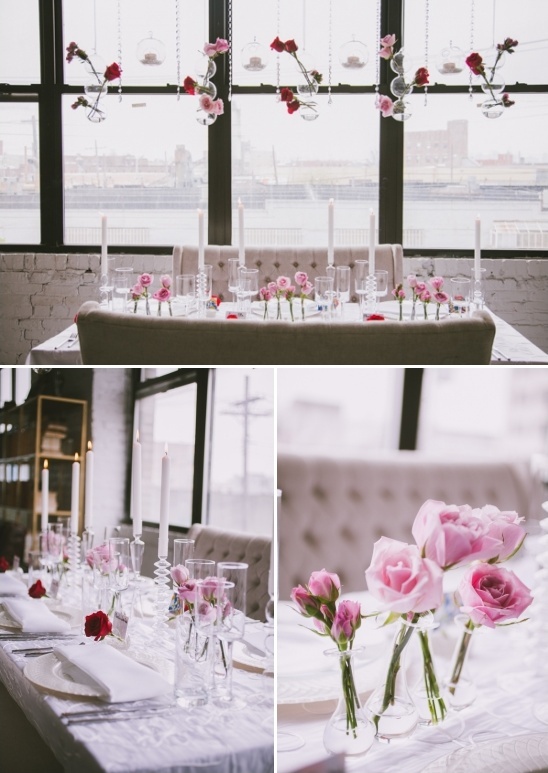 Name cards were placed in mini glass vases with red roses; glass candle holders and bud vases served as centerpieces. 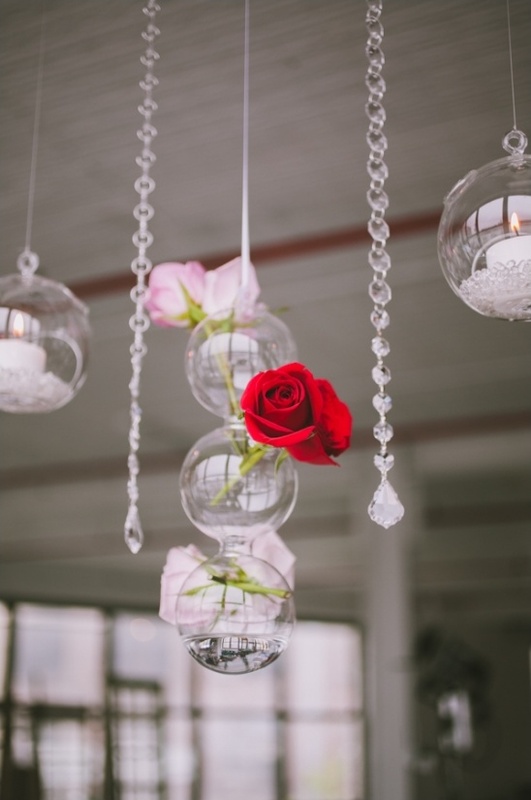 A handmade, custom-designed chandelier with crystals, hanging candles and more roses glistened overhead. 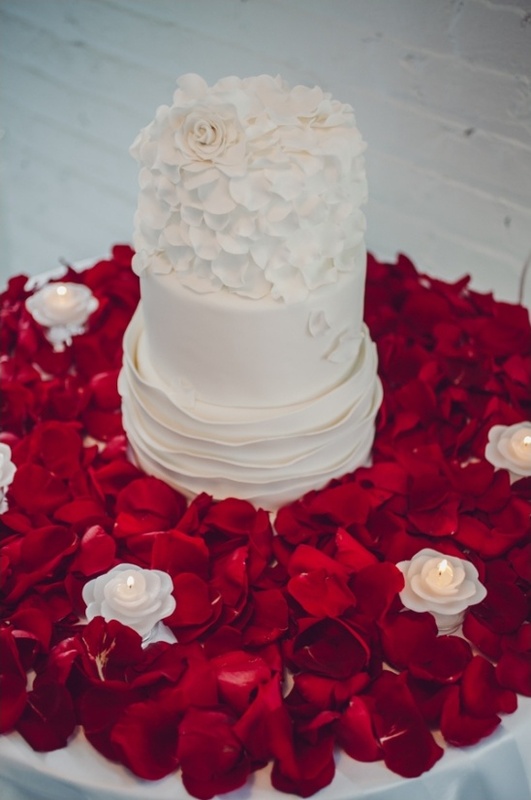 In keeping with our floral theme, I decided on a cake inspired by the graceful shape of a rose. The bottom layer is meant to resemble enlarged petals, while the middle and top stand in for a stem and flowering bloom. To finish, it's topped with fresh red petals for striking effect. Don't think we forgot about the groom. 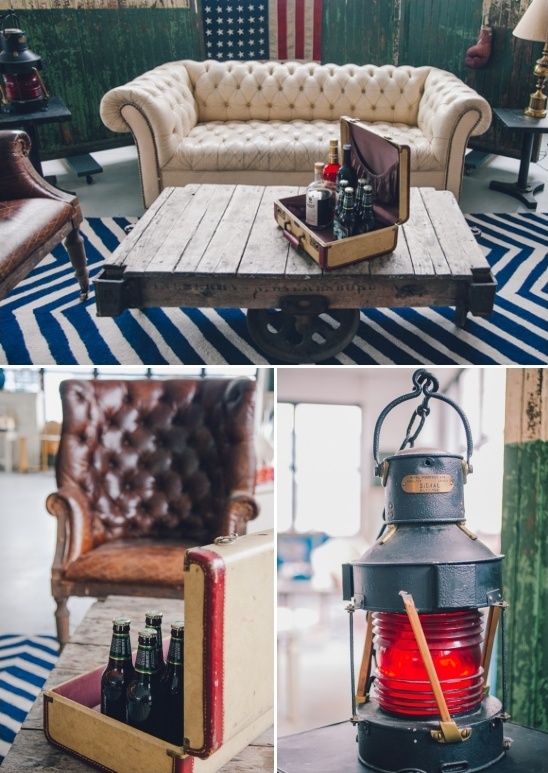 Jove Meyer Events also created a masculine prep area for him to relax with friends before the ceremony. 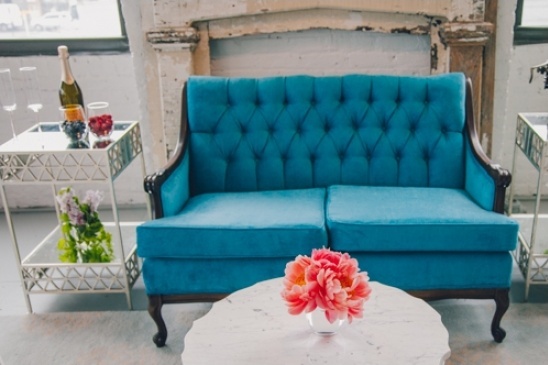 Complete with vintage rentals from Patina Vintage Rentals including -leather chairs, a rustic wooden coffee table, vintage boxing gloves and a stunning vintage American flag. 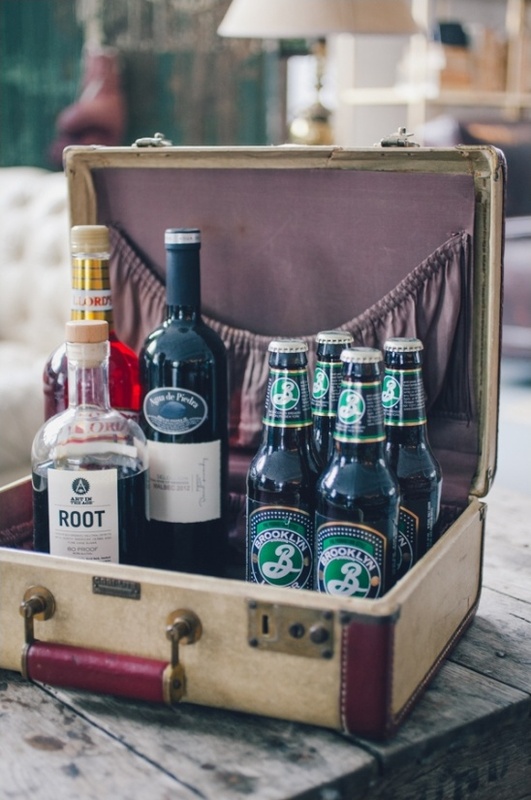 For refreshments, beer and whiskey galore! In the end, simple elegance was the driving force behind the day's design, and each item was carefully selected or created with whimsy and romance in mind. I was thrilled with the outcome - mission accomplished!